German energy engineering service provider Cendid Energy Solutions has announced that it will deliver turn-key energy management solutions across the Asia Pacific region through its Singapore hub. The company, which helps industrial clients reap energy cost savings whilst cutting down their carbon emissions, has recently incorporated in Singapore through company registration specialists Rikvin. 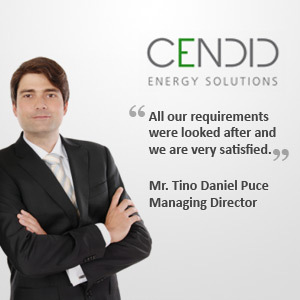 Cendid currently offers turn-key solutions that include a thorough diagnosis of clients’ issues, design engineering and concept development of the solutions and finally, the installation of the solutions. The energy management firm plans to expand its team and have Singapore professionals on board to run the business in Asia. It also wishes to explore the markets in the region and help clients reduce their carbon footprint sustainably. In the process, it looks forward to a solid and improved customer base. Cendid is also the winner of Rikvin’s Dragon Year Promotion Draw. The draw, which spanned between 15 December 2011 and 31 January 2012, was open to all clients who have engaged Rikvin for company incorporation services and remained as clients on the draw date, 1 February 2012. The draw was public and Cendid Energy Solutions took home an Apple iPad2 64GB within five days of notification. Cendid Energy Solutions is an energy engineering provider that aims to help industrial clients or plants reap energy cost savings whilst cutting down their carbon emissions. Cendid offers turn-key solutions that include a thorough diagnosis of issues, design engineering and concept development of the solutions and finally, the installation of the solutions. Cendid was established in Germany and has expanded to Singapore to serve the regional market.